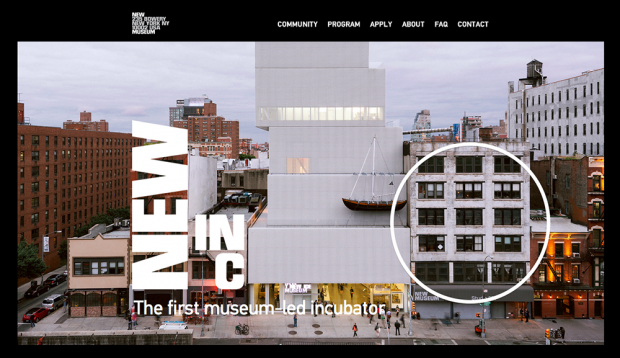 From the website: NEW INC, the first museum-led incubator dedicated to art, design, and technology is a not-for-profit shared workspace and professional development program supporting cultural practitioners and creative entrepreneurs. The New Museum’s directors, together with David B. Heller, the New Museum’s Vice President of the Board of Trustees and NEW INC Advisory Council Chair, assembled a distinguished group of advisors with significant expertise and leadership in areas of entrepreneurship, technology innovation, architecture, design, and visual arts. The NEW INC Advisory Council includes: Sunny Bates, CEO, Sunny Bates Associates, Lauren Cornell, New Museum Curator, Curator, 2015 Triennial, Digital Projects, and Museum as Hub, Kate Crawford, Principal Researcher, Microsoft Research, Fred Dust, Partner, IDEO, David B. Heller, Private investor and philanthropist (NEW INC Advisory Council Chair), Aaron Koblin, artist and Creative Director, Google Creative Lab, John Maeda, Design Partner, Kleiner Perkins Caufield & Byers, former President of the Rhode Island School of Design, Neri Oxman, Sony Corporation Career Development Professor of Media Arts and Sciences at the MIT Media Lab, Yancey Strickler, Cofounder & CEO, Kickstarter, Andrew Weissman, Partner, Union Square Ventures, and Cofounder of Betaworks, Mark Wigley, Dean, Columbia University, Graduate School of Architecture, Planning, and Preservation.